To recap: TV Ghost released one of the best debut singles of recent vintage with the “Atomic Rain” 7″ on Die Stasi (a label I miss greatly) back in ’07, then floundered a bit with their first LP and ‘Cold Fish’, where I thought Tim Ghost was sort of trying to find his niche, then exploded last year with a new line-up, the spectacular ‘Mass Dream’ LP and a couple of mind-bending live shows I caught where I felt the guy had his band and ideas exactly where he wanted them to be. The A-side here continues in the scary synth explorations and gurgling low end drive of the LP, with him throwing guitar at all the angles and delivering the vox from another dimension. They do rely on the horror film score vibe here (it’s called “Phantasm” after all), with the repeated synth line creating the tension and slipping some echoed effects and screams underneath the instrumentation, but it works. “Panic Area” on the flip slows it down for a swirling and sinister crawl with some oscillating undertows and plenty of echo bouncing around the cavern they’re recording in. The A-Side works real well and compliments the work on the LP, the B-Side holds its ground and they really nailed the recording on this one. The band has a tall order to fill with their next LP, and I think they’re up to the challenge. Can’t wait. Scum stats: 500 copies on black with classic Sweet Rot textured sleeves. In other news, I just noticed Jeff has a nifty little label website now, looks good and beats the ol’ Myspace page! I think I first met TV Ghost back in 2007 after talking about their single on Die Stasi, and I really wonder if it was even the same band? These guys are dedicated, honing and refining this creepy sound for years to end up in this disturbing unique place. 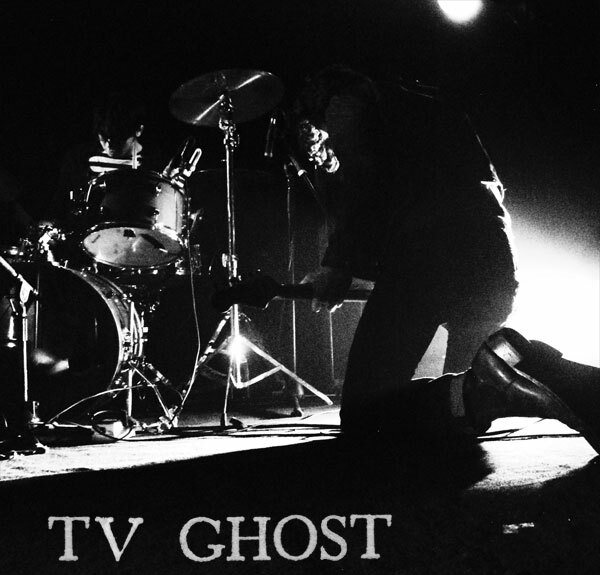 But then again TV Ghost has a facebook page now…or should I say Television Ghost…maybe that explains it. A-Side’s “Phantasm” sounds like these guys have taken on a full psych attack strategy but maybe that’s thanks to these organ squeezes, the vocals are just as disturbed as I remember. A dirty gutteral bassline under haunted house organ grinds. Split vocals, distorted across both speakers following that eerie organ melody. The springy reverb when finally released is an insane distant thunder thwack from the tesla coil in the next state over. I think from some of the previous reviews I read I was expecting this to be way more polished but they’re still carrying this raw, unpolished edge. It’s all done on a real passionate scale, the gunshot clicks from ungrounded cables are like sparks, electricity connecting that circuit, heavy and smacking. Still sounding like a Deadbolt neighbor, from down in the lab. They are plenty frightening, the distortions going way beyond just that guitar noise, but disembodied voices from the next room. Things get almost free jazz sounding with all of the layers of haunted organs and amplified strings and then it all stops suddenly. The ghosts of the tv have blown a fuse. B-Side’s “Panic Area” – now that I’m hearing this ensemble more clearly, you get a sense for the true weirdness of these tracks. The bounced back and forth vocals and their deadpan monotone inbetween manic bursts of chorus the whole thing falls apart, they’re getting closer to the Nothing People than the wave of no-fi glitched out layered whatever-gaze direction a lot of other bands continue to explore. The vision is a lot more clear musically and the end result is maybe a little more disturbing now that you can hear every note. Like a halloween ride, a screamy blues laughing ghost ride …TO HELL! Creep me out. In a sleeve/inner sleeve textured cardstock, on black vinyl. Sweet Rot.